C.A.W. HVAC Company Inc is proud to serve the Corpus Christi community! 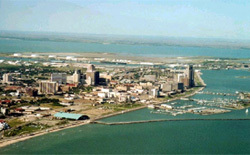 About Corpus Christi, TX - Happy to be your hometown Heating & Air Conditioning Contractor! Corpus Christi is a large city in Texas. Home to approximately 308,000 residents, the area is rich in historical value. It was founded in 1839. Public education services are provided by the Corpus Christi Independent School District and for continuing education there is the Texas A&M University Corpus Christi, Corpus Christi College and several other colleges and universities. Corpus Christi is host to a wide array of attractions, events and festivals. Fun and adventure for people of any age can be had at the Texas State Aquarium which is located in Corpus Christi. History enthusiasts can learn about the area's history at the USS Lexington Museum while nature enthusiasts will love the exquisite beauty and tranquility of the South Texas Botanical Gardens and Nature Center. Corpus Christi is in a humid subtropical climate. This means that summers are hot and lengthy, while winters are short and generally mild. It's a great place to avoid the harsh, cold winters of other areas, as well as a great vacation for travelers looking to soak up some sun and enjoy the many outdoor activities and events that Corpus Christi has to offer.